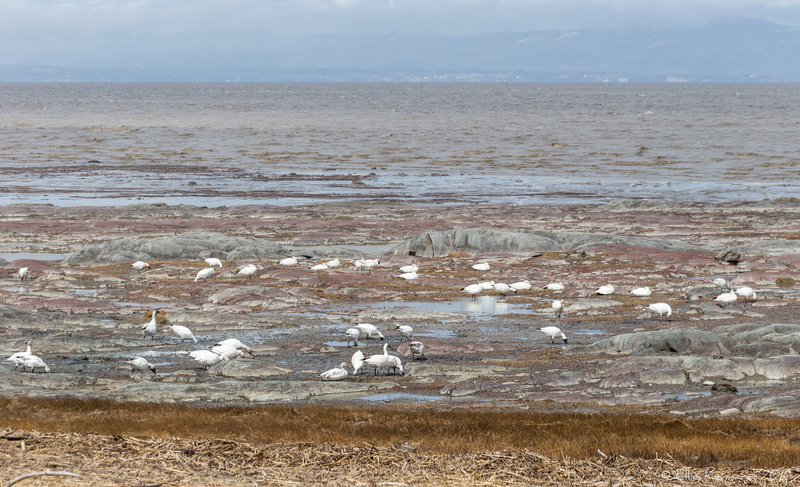 On our recent trip along the shores of the Saint Lawrence river, wending our way to Quebec city, we stopped to watch this flock of snow geese wading through the marshy mud flats, feeding on he various aquatic plants, grasses etc. I was mystified by the black legs as the bird is described as having pink ones, until I realized that they were probably just covered in black mud! Snow geese, according to my birding app, pass through on their way in a Spring migration, and this was a first sighting of these birds for me. According to iBird, during the summer their heads are often stained red from gathering food in iron oxide laden mud. Across the river you see the mountains of the opposite shore rising out of the mist, with the last of the snow trails just visible. Those who have followed my postings on G+ have probably noticed that it's been a long time since I posted. No, I am not posting somewhere else, I have not moved to a new social network ;-). I have not been on a mentorship. I have just been ill, not able to do what I wanted to. So now I am hoping to be able to get back into sharing some of the images I have taken recently. This one, however, was taken this time last year, when I was in Ontario. It seemed a good time to share it, as the colours are still beautiful, though many of the leaves have fallen. I hope you enjoy it. For all my G+ friends, most particularly my good friend +Ursula Klepper who is a terrific support and friend, behind the scenes. Thank you Ursula. One of these days we will sit on that bench and talk. Maybe beside a lovely lake such as this. Are you not able to comment on Google+ because you don't belong? Would you prefer to comment on my blog? It's right here with all my G+ posts on it: https://www.elliekennard.ca. Until I learn otherwise, I am saying that it is probably an immature female wood duck, as identified by +Mike Goodwin and seconded by +Stephen Thackeray – thanks a lot you two! I will change the title once we are 100% sure. Another young bird photographed on the same overcast rainy day in Miner's Marsh in August. I thought it was a young mallard, but I see more clearly now that it probably isn't, as there seem to be no photographs of mallards with white stripes around the eyes and the base of the bill is not the right colour. There are many wrong things about it (not wrong, of course, just wrong for mallard) in my thinking, so I am stumped here. My bird app has not come up with an answer. Can you? I walked around the Kentville Miner's Marsh area a few weeks ago, on a dull day and managed to see quite a number of wildfowl, many of which were too far away to get decent photographs especially as the light was poor and it was windy. This youngster was swimming and diving not too far from the shore and I got several of him. I thought at the time that when he went underwater it was almost as if he didn't so much dive as simply submerge out of sight. Almost as if he sank underwater. He was a little hard for me to identify and even another (much better) bird photographer didn't have any idea what he might be, looking at my photographs. I was a little disheartened (feeling that my images had not done the bird justice) until I found it on my bird identification app and the images of it were no better than this one. He looks very odd, quite like a clown as the article below says. The Sunday of April 14th was a red letter day for me. I saw two birds that were firsts for me. One was this snowy egret, which is a rarity in our part of the world, the other was an unusual bird whose photograph I will post shortly (one per day for the project, so it has to be for another day). During the week before, I had been hearing about the snowy egret sightings that had been announced on our rare bird watch group and was feeling frustrated as they were all a fair distance away from where we live. On top of that, the renovations going on in the house meant that it was impossible to go for a long drive and just abandon the work. And of course going for a drive to a 'last sighted' location, over 1 hour drive away did not guarantee a sighting – it could have been a wild goose egret chase. So I kept quiet and said nothing and, I guess, felt a bit sorry for myself. On Sunday another sighting came in and this time, with the work temporarily halted, I mentioned it to Steven. In no time at all I found myself in the car and on the way across the province. It was a dull grey day, with a drizzle falling at times, but it was nice to get away from the dust and rubble, even if we hadn't sighted the egret. As you see here, of course when we got there, it was still feeding along the banks of the bay. I couldn't get as close as I wanted as it was a good way across the water, but I did get a good number of photographs of it. A great blue heron was keeping it company and it was lovely to just sit in the car and watch this rare visitor.